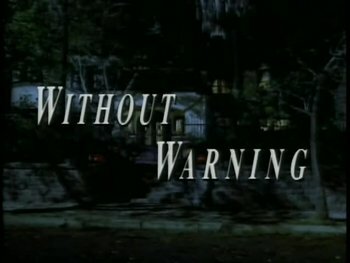 Without Warning is a CBS Made-for-TV Movie from 1994, directed by Robert Iscove, that interrupts the regularly scheduled program with a breaking news story about a meteor impact in Wyoming that is quickly joined by bizarre phenomena (including an apparent Rapture) and a pair of other meteor impacts in France and China which, together with the first, form a pattern that appears to some scientists as deliberate. Like the 1938 radio production of The War of the Worlds this movie is a Phony Newscast that was broadcast on Halloween, and allegedly more than a few people were taken in by the realism. You don't have to take our word for it, though; it's on YouTube . This wasn't the first time American network TV had aired a realistic newscast: in 1983 a nuclear terrorism incident was dramatized in Special Bulletin. Not to be compared with the 1980 Sci-Fi film also titled "Without Warning". Apocalyptic Gag Order: The government tries to keep quiet about the third wave of impactors coming to Earth, but this is defied by Dr. Mandel, who quits his work and announces the incoming doom in an impromptu news conference before leaving to live what he believes are his final hours with his family. Apocalypse How: Class 5-6. Best case scenario still involves millions of deaths by Colony Drop barrage. Worst case scenario is total extinction. Artistic License  History: Zig-zagged. At roughly the halfway mark, the White House press secretary mentions that the president has directed NASA to look for objects which might enter the atmosphere. While NASA didn't start doing that until late the following year, someone on the production staff must've asked the right person about it, because the telescope named in the show as having spotted the second impactor is indeed the one NASA would use when they started their program in 1995. It should be noted that at no point is a year ever actually given for the events of the film, so anyone watching a rebroadcast or DVD in 1995 or later wouldn't notice the discrepancy. Artistic License  Military: A scientist, named Dr. Avram Mandel, regards the destruction of the second impactor as a declaration of war against the aliens, who have at that point announced their presence by repeatedly bombing our planet with asteroids, killed two innocent people including one little girl in order to send a message, and (possibly) kidnapped the entire population of a small rural town in Wyoming. While it's admittedly an extreme point of view, some might consider such behavior to constitute an act of war in its own right, an attitude arguably borne out by the aliens responding to initial defensive action by attempting to disable the capability thus demonstrated, and responding to further defensive action by attempting to murder everyone on the planet. Truly, what else could they be but misunderstood space angels? A near-real-time "infrared image" of one of the first impact craters has the northeast quadrant of the crater in sharply delineated shadow, which a true infrared image of a fresh crater wouldn't, but a recolor of a visible-light image would. For bonus points, such a shadow would only appear in a daylight shot; for double super special bonus points, the shadow in the image is far too high for the declination of the sun in northern Wyoming in late October. Sharp, clear photos of phenomena on Earth's surface are said to have been taken by the Hubble space telescope. Hubble can't clearly image anything on Earth; it is after all a space telescope, and its orbital speed and imaging hardware are both tightly optimized for that role. Terrestrial imagery is what spy and weather satellites are for. If anything, Hubble might have been used to try and image one of the incoming "meteors" but even that is unlikely. Related to the above, a nuclear missile vaporizes one of the impactors mere moments before it hits a major city. It's close enough for the reporter and everyone else to see it in the sky. In fact they're looking right at it at the moment a nuclear weapon explodes and detonates it. In reality, being blinded by the flash would have been the least of their worries, given they would most likely have been vaporized by the blast. Whoever's behind the attacks is implied, albeit somewhat loosely, to be responding in real time to the actions of people on Earth; for example, after the second impactor is destroyed over the pole, the third wave targets the world's three most important capitals. Given that the whole show plays out in less than an hour and a half, that nothing aside from the asteroids themselves is detected in near-Earth space, and the extremely low (~14km/s, lower for the big ones) velocity with which the impactors arrive, this speed and flexibility of response strongly suggests some kind of "cloaking" capability on the part of the unseen aliens, which would be necessary both to station a ship close enough to observe the response to each wave of impactors, and to place the asteroids themselves close enough to Earth to land them at the observed times without having them spotted much earlier than they are. As Herself / As Himself: To lend authenticity to the Phony Newscast, (then) well-known journalists Sander Vanocur and Bree Walker appear as themselves, and Arthur C. Clarke appears for an in-universe interview. (Unfortunately, acting does not appear to have been among Dr. Clarke's many attainments; where in interviews he was generally quite lively and engaging, here he comes off rather flat.) A couple of other recognizable reporters appear in press conference scenes. Averted, however, by having a well-known TV actress play Vanocur's co-anchor and an actor well known for his appearances on Star Trek play one of the reporters. Bland-Name Product: The news network is not mentioned by name, and the logo is similar to, but distinct from, the CBS "eye", looking instead more like the Green Lantern logo. This example is notable in that the motivation is not to avoid trademark infringementCBS would naturally have had the right to use its own logobut to make it more obvious to viewers that what they were seeing isn't real. Blue and Orange Morality: The aliens appear to operate on this, as they don't seem to understand how or why bombarding the planet in an attempt to communicate could be interpreted as hostile. Broken Aesop: When Sufficiently Advanced Aliens peacefully introduce themselves by peacefully bombing our planet with peaceful asteroids, we shouldn't defend ourselves, because such warlike behavior might provoke them to peacefully recreate the K-T extinction event. Caught Up in the Rapture: Among many strange things that the aliens do throughout the film, they kidnap an entire townful of people. Comparisons to the Rapture are made In-Universe, which is a little on the nose in light of what happens later. Colony Drop: The meteors are initially conjectured and later confirmed to have been launched at Earth by an extraterrestrial intelligence. Deadline News: What the entire film-slash-"live broadcast" ends up becoming. Death from Above: Meteors raining from space with unusual precision. Downer Ending: As far as it looks before the broadcast is interrupted by a meteor impact, the entire world is doomed to destruction. The End of the World as We Know It: The final destination of the Earth, leading into the Downer Ending. External Consistency: If you wanted to clobber multiple points along the same latitude, starting over the pole would be a reasonable way to do it. Face Death with Dignity: While the entire rest of the cast go through a severe case of wide-eyed shell-shock as they see the world end, Vancour calmly assures people that the news broadcast will continue for as long as possible and provides the Famous Last Words below. Fake-Out Opening: The presentation begins as a murder mystery film, starring Loni Anderson in a cameo, which itself is titled Without Warning. Quickly, it is at first interrupted by a short special bulletin hosted by Sandy Hill, before it is interrupted again for good by the newscast. Famous Last Words/Shout-Out to Shakespeare: "The fault, dear Brutus, lies not in our stars, but in ourselves". Found Footage: Just a dab, showing the first impactor on its way down. Compared with more recent non-fictional examples of a certain meteor entering the atmosphere , the SFX team's efforts are surprisingly creditable; the only really obvious error is that a real meteor comes down a lot slower than you'd think. Curiously, a later Stock Footage clip shows a real meteor coming down at a plausible rate. Why the Found Footage clip doesn't is anyone's guess. Government Coverup: Of the third wave of impactors. It doesn't last very long thanks to Dr. Mandel. Heroic Sacrifice: Two F-16s dispatched to shoot down the second impactor are destroyed seconds before their nuclear-armed rockets hit it. Despite their deaths, the mission is successful, and the impactor destroyed. Hope Spot: The nuclear weapons launched at the third wave of meteors successfully neutralize the threat to Washington, Moscow, and Beijing. Cue a rather silent Mass "Oh, Crap!" moments later, when hundreds of new meteors are detected hurtling down, dooming all life on Earth. Horror Doesn't Settle for Simple Tuesday: The entire situation occurs, from initial impact to the total annihilation of humanity, over the course of an hour and a half (not counting ad time) of a Halloween evening. This is another element of the Shout-Out to the Mercury Theater radio version of The War of the Worlds. Humans Are Bastards: Heavily implied, despite frankly quite measured defensive responses throughout; there is, after all, nothing unreasonable about defending one's planet against unprovoked and deadly attack. The opposing perspective doesn't get so much as a moment's worth of air time. Ignored Expert: Dr. Avram Mandel, an expert in alien intelligence, mentions that he repeatedly said that the aliens were peaceful from the moment he was called by the government, but in the face of the obvious, he was ignored... he says this as he leaves for his home to spend what he thinks are his final hours with his family, which gave him some more time than the rest of the planet. Infant Immortality: Set up and then averted. The young 8-year-old girl dies, and then the rest of humanity. Jive Turkey: Downplayed, but still present, in a "man on the street" interview with a young black college student. Kill 'em All: In defending ourselves from alien first contact (mostly because it didn't look like first contact), we have proven ourselves to be hostile to them, and their immediate retaliation completely annihilates the world. Phony Newscast: The story is told in such a format as a deliberate homage to The War of the Worlds. Poor Communication Kills: The whole apocalyptic mess could have easily been avoided if the aliens had found a less destructive way of announcing their presence or at least if the military hadn't decided to shoot first and ask questions later. Real Time: Almost. Barring some commercial breaks, the whole movie follows the live broadcast from the moment the initial meteor impact is detected up until the aliens' attack apparently destroys the broadcast center. However, the characters occasionally make statements about the timing of events that don't track (and would be impossible) with the runtime of the movie. The Reveal: The first meteor impacts were in fact an attempt at first contact by an alien species, and, by destroying the follow-up impactor barreling toward the North Pole at the highest speed cited in the show, Earth has declared war on the aliens. Screw the Rules, I'm Doing What's Right! : Dr. Mandel responds to the coverup of the third impactor wave by resigning from NASA and announcing the incoming asteroids in an impromptu press conference. Screw This, I'm Outta Here! : Various members of Mission Control can be seen during the Mass "Oh, Crap!" running out of the room, presumably to spend their last moments with their family. Shoot the Shaggy Dog: See above under Kill 'em All. Shout-Out: In addition to the choice of date and format, the first meteor impact is noted as sixty miles north of the fictional town of "Grover's Mill, Wyoming," a reference to The War of the Worlds, in which the initial Martian landing site was Grover's Mill, New Jersey. The first broadcast of the film included a prologue and disclaimer that explicitly credited the older work. The William Shakespeare quote at the very ending of the film. Starfish Aliens: Seriously, what kind of people introduce themselves with a nice brisk planetary bombardment? Alien snakes in latex have nothing on these guys! Techno Babble: Mostly avoided, which is all to the good; an eerie high-pitched howl coming from the initial impactors is said to be "on the edge of the FM band", which isn't even the same kind of wave as audible sound, and to have its origin in a "pulsating charged ion field...of natural origin", which to make any sense at all would have to be a plasma of the sort that can't exist in ground-level atmosphere without an ongoing energy input and ideally some kind of containment. For comparison, the handiest example of an uncontained plasma at ground level is lightning, which does produce broadband radio interference, albeit concentrated far below the FM or even AM range and thus unlikely to produce the deleterious effect on air traffic that's mentioned in the show. Two Halves Make a Plot: On every impact site of the first barrage of meteors, one person survived, heavily injured and continuously saying gibberish. Right after the second barrage of meteors is shot down, they all die at the very same time and their gibberish is spliced together, revealing that they are all saying a piece of the recording on the Voyager probes, inviting aliens to come to Earth. The Un-Reveal: During the timeframe of the movie, we never learn anything about the impactor in the Gobi Desert - who was affected, who carried a part of the alien's message, etc. Truth in Television as, given the very short timeframe of the movie (everything happens over the course of only a few hours), there was simply not enough time for Chinese officials to follow-up on an event in a remote desert area, as opposed to the other two parts of the message that were relayed in locations more readily accessible. We Come in Peace  Shoot to Kill: The aliens found one of the Voyager probes, and were only trying to make first contact with Earth. Unfortunately, their methods — performing a Colony Drop on equidistant spots on Earth that would cause tremendous damage upon potential impact, and following it up with another one which would produce a tsunami more destructive than any in recorded history — provokes the armed forces of the United States to make a move which, while purely defensive, they saw as hostile. Cue The End of the World as We Know It. We Interrupt This Program: The fake murder mystery presented at the beginning is preempted by the newscast. Wham Line: "I'm so sorry. I'm so so sorry."